Avi Poster: "My parents were immigrants; they had challenges when they came here, but they were made to feel welcome in this country"
On September 30 at La Hacienda in Franklin, Williamson County resident and Chile native Cecilia Melo-Romie (no relation to Eva Melo) threw an event to launch a dialogue on the successful integration of new arrivals in Williamson County. The event featured two of the county's elected officials and many of its residents. The moderator was Avi Poster, who jokingly described himself as an "adopted" Williamson County resident on account of his frequent visits to its restaurants. 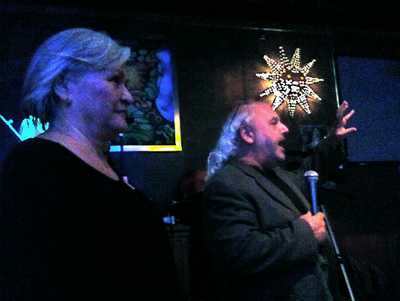 After Poster asked the crowd to thank La Hacienda owner and host Salvador Guzman ("one of Williamson County's favorite citizens"), he described Nashville's efforts to redirect "awful" conversations about new arrivals to the city, which led to the Coalition of Education about Immigration, which now claims 1200 individuals and 40 organizations among its members. Poster said the purpose of the event was to help bring "that conversation" to Williamson County about 30 days out from the event, which is right about now. My parents were immigrants; they had challenges when they came here, but they were made to feel welcome in this country. Williamson County resident and Loews Vanderbilt Hotel's Tom Negri described the efforts of Nashville for All of Us to beat back the Virginia-funded English Only referendum in January. He mentioned that the Nashville Area Chamber of Commerce was recently named the No. 1 large chamber of commerce in the country by American Chamber of Commerce Executives, in part because of the chamber's role in Nashville for All of Us. Negri also mentioned that he spent three years in Colombia, his wife is Colombian, and that his oldest son Danny just bought a house in Williamson County. He told the story that on Danny's first night in the home, one of his neighbors called the police reporting a Hispanic male in the back yard of that house. So while Danny was watering trees he had planted behind his own home, three police cars pulled up and wanted to know what he was doing there. Negri said "the officers were great" - in fact, they actually knew Danny. "But these things happen, and we don't want them to happen," said Negri. Fabian Bedne of the Middle Tennessee Hispanic Democrats urged new citizens to vote so that political campaigns would take them into account. He also pointed out that even though some campaign strategies focus on the voters of the last ten election cycles as those voters most likely to influence an election, candidates should remember that such a metric will discount active and interested new citizen voters, who will show up only for the election cycles since they obtained their U.S. citizenship. Bedne also mentioned his bipartisan efforts, along with his Republican colleague Raul Lopez, to register new citizens to vote. Together, they fought the misperception that speaking Spanish means that you aren't a U.S. citizen, when the fact is that certain U.S.-born citizens (like residents of Puerto Rico), as well as older immigrants, may not be fluent in English but are nonetheless U.S. citizens and eligible voters. See their joint statement here, including the excerpt, "To say that a Latino who doesn't speak perfect English is not a citizen is simply wrong." Another attendee's account of the event is at Sarah's Juniper Tree. I have more on the event which I hope to post later. Photo by John Lamb. Licensed under Creative Commons.